WHAT MACHINES CAN'T DO: The ART IN ARTISAN Deliver Uniqueness, poignant product of human beings. Each performance, a "soloâ€. For you, and you only. Time is Money. Is it? But then, again, we choose our priorities, don't we? So we let that dough rest and prove for 20 hours because that's what it takes to develop its full spectrum of taste. WE BELONG TO THE EARTH NOT THE OTHER WAY AROUND. We work with Seasons, Each one marked with its triumph of ingredients, flavours and nutrients. Fresh ingredients, organic every time we can. It's a promise! Free Wifi... or Wifi Free? The buzz of conversation and laugh is so much better than computer screens. We have that at the office, right? FOOD IS CULTURE CULTURE IS FOOD. Nothing connects us with the land more than food. Nothing bonds us together more than sharing a meal. Breaking bread. Slicing a cake. 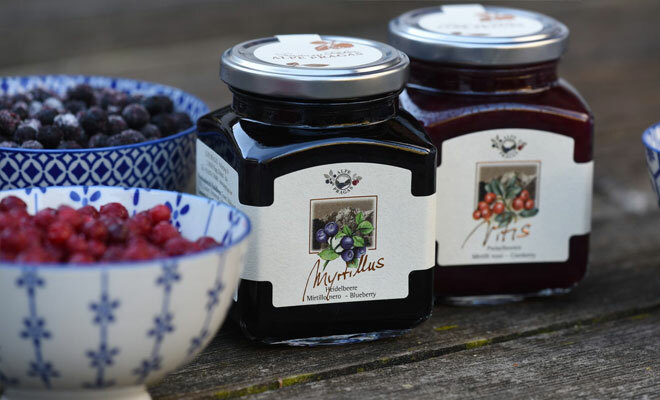 Europe is a treasure chest of specialties with hundreds of years of history behind. Our exploration goes on. We all know that carbohydrates are the necessary foundations of our food pyramid. Carbs provide us with the energy necessary to function, with the energy content of bread ranging from 225 to 260 calories per 100 grams. 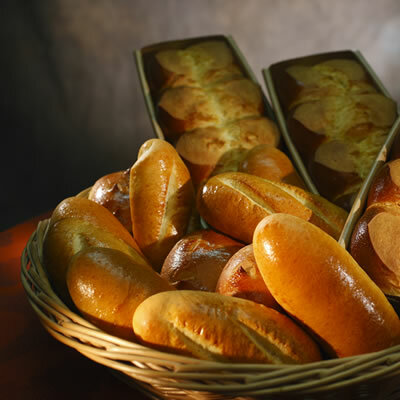 The nutritional profiles for bread vary depending on the flour used in its preparation. In fact the distribution of the nutritional substances in the grain consists of a husk containing fibre, structural proteins, minerals, vitamins, the nucleus consisting of starch and proteins, the germ a source of minerals, vitamins, proteins and fats. Wholemeal wheat also provide a good source of insoluble fibre essential for a healthy digestion and as a regulator of intestinal functions. The "insoluble fibreâ€, consisting of cellulose, hemicellulose, pectin and lignin does not modify during digestion performing an important role in regulating the blood sugar level, as well as lowering the lipid (â€bad cholesterolâ€) content in the blood. 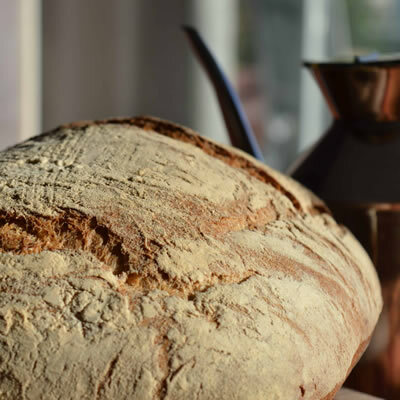 Beside carbs (energy), fiber (precious allied of digestion) and protein, wheat flour also provides Iron, B Vitamins, Thiamin, Niacin, Magnesium, Phosphorus, Zinc. 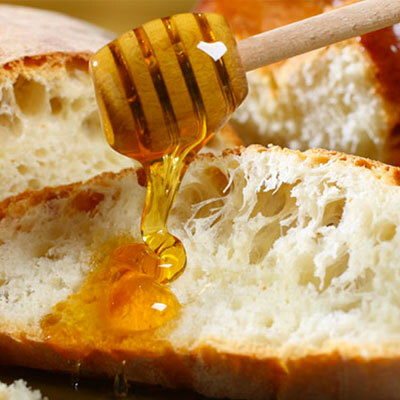 A white, very light bread, one of our best sellers, a favourite with kids. The guts is airy and fluffy. Suggested use: for bruschetta and to company savoury spreads and cured meat like hams and salami. Ingredients: White Flour, Water, Salt, Fresh yeast. There is nothing more French than this baguette. Long, light and airy, it has a crunchy crust. This is achieved with a steam jet imparted in the oven while baking. The white baguette is ideal for a crunchy and light lunch sandwich. The flour is milled with a stone wheel. Because of the porosity of the stone and its slow speed, the wheat germ is retained inside, preserving more vitamins. 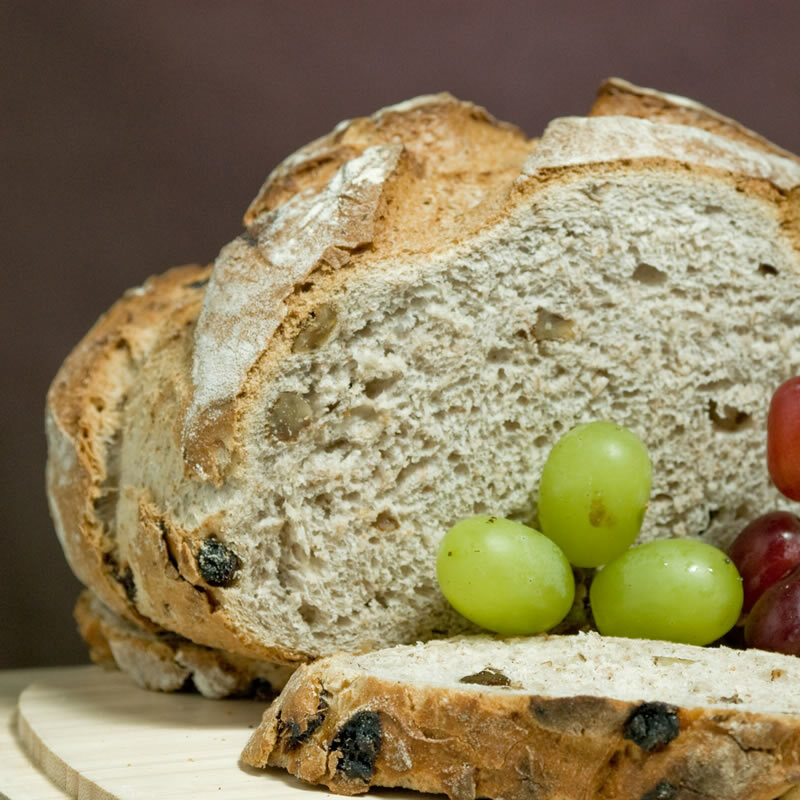 Preferred by many bakers and natural food advocates because of its texture and nutty flavour. Ingredients: Stoneground Flour, Water, Sea Salt, Fresh Yeast. 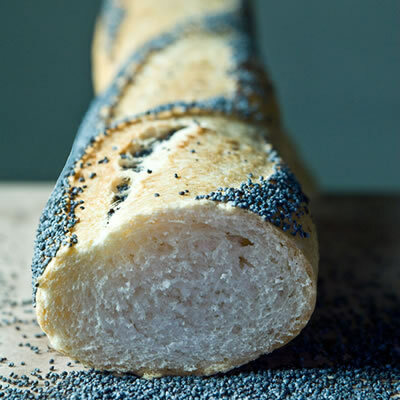 A French Multicereals bread, with Wholemeal flour, linenseeds, Sunflowers seeds, Sesame seeds. Nutritious and rich in fibers. 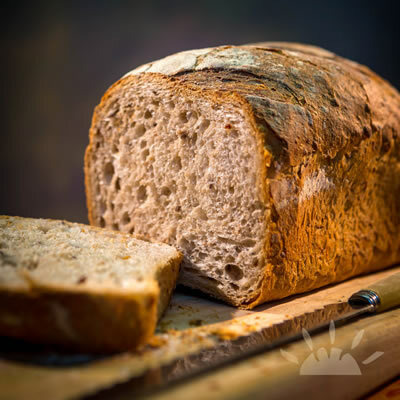 All our breads and cakes are made with calcium propionate free flours. 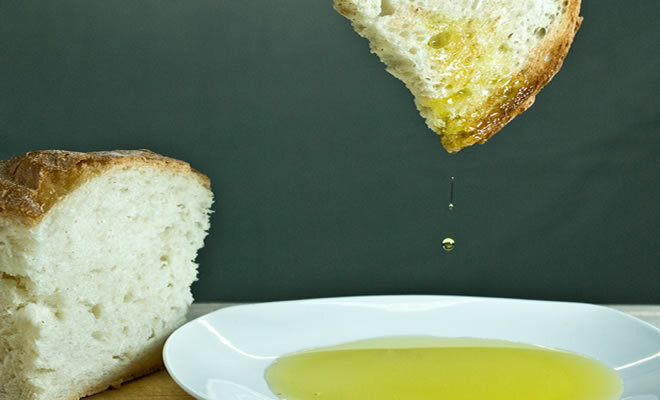 no enzymes, preservatives, cheap vegetable oils, additivies. This is a very rewarding bread experience, nearly a meal in itself. Low in gluten and high in fibre. A Sunday feast, this recipe from Britanny accompanies in glory both sweet and savoury dressings. 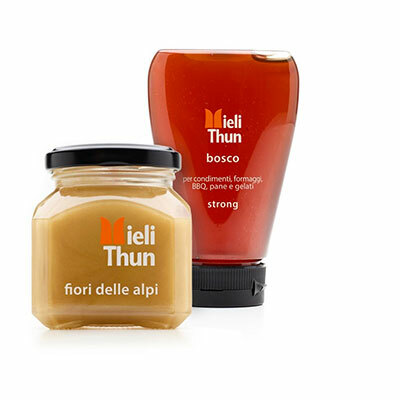 I l Valentino is exclusive importer in Ireland for Alpe Pragas Jams, 75% fruits and Mieli Thun. Visit our shop to select your favourites.